Blog posts titled Wuthering Moors are about the issue of burning of blanket bogs by grouse shooting estates (e.g. Wuthering Moors 28, 15 October 2012), the inability of the government agency Natural England to do its job properly on regulating landowners on protected moorland sites (Wuthering Moors 68 – the background to an unlawful decision, 11 May 2018 and Wuthering Moors 67 – a significant victory, 10 May 2018) , and the pickle into which the UK government has got itself with the European Commission over its poor implementation of the Habitats Directive (eg Wuthering Moors 70 – EU infraction proceedings, 13 August 2018). Today the quite wonderful Guy Shrubsole has released the list of estates that have signed up to Defra’s worthless promise not to burn blanket bogs – see here – and also those who have not made the pledge. Most notable of all the estates is the fact that Walshaw Moor estate appears not to have signed up to Defra’s MoU which is not worth the paper it is written on. Almost everybody else has signed up (including the likes of the Bleasdale and Abbeystead estates in Bowland). 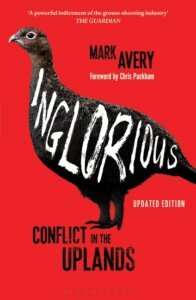 The apparent unwillingness of Walshaw Moor to sign up is particularly interesting given that this long and sorry tale started with events on Walshaw Moor back in the mists of time – or at least as far back as 2011 and actually further back than that (see my book Inglorious – conflict in the uplands for a readable account of events and search this site for all ‘Wuthering Moors’ posts for a staccato, ongoing update. I have a certain amount of respect for the millionaire owner of Walshaw Moor, Richard Bannister, who seems to plough his own furrow, and his own grouse moor, more or less as he pleases without too much notice of what everyone else is doing. On Twitter I see that today, the day when the heather burning season opens in England, the fires are burning above Hebden Bridge. Whether this is on Walshaw Moor I don’t know for certain but it certainly looks like it to me, and whether this is on blanket bog or heathland I cannot tell. It would be interesting to know, but difficult to be sure at this stage. Also notable absentees from the list of estates promising (in a non-binding agreement) not to burn blanket bogs are the Mossdale Estate owned by the van Cutsem family and the Crag Estate in the Peak District. Interesting. What we need is some citizen science monitoring of grouse moor estates to check whether they’re keeping to their word during the burning season. It’s a daunting task – how do you keep tabs on what happens over half a million acres of upland? – but I hope the revelation of this list, and our evolving map of grouse moor estates, can help. And let’s be clear. Any instance of an estate going back on its word, and carrying out rotational burning despite its pledge not to, should be further reason for Michael Gove to ban moorland burning outright. Didn't see any burning on north east Peak today but only got out there late afternoon. Will check more in coming weeks. Mark - am I right in thinking that not only will all these estates be getting the basic flat rate payment for simply farming land, but also top ups because they are SSSIs etc ? Your thoughts on the future of the uplands in the Manifesto would surely result in a direct cash saving even before taking into account the carbon, water and wildlife benefits ? All you need is a GPS (free phone app) and a walking pole to measure the depth of the peat. We should all read the muirburn code and record the breaches. It would be good if there was a central site where we could record them all. Lets build the body of evidence into a mountain. Seems barmy that we monitor a worthless MoU, which was effectively PR spin bowling for the politicians to be seen to address the issue. But, as mentioned above a series of dates, sites along with images (stills or videos) to be used as evidence adds grist to the mill as they say. One might be forgiven for pondering if the payments such estates receive might be rescinded if they breach MoU etc.? I have always felt since I read the manifesto for wildlife that each of the 200 aims split between the ministries need a separate platform for implementation. I did build a demonstration set of websites for 3 of the ministries and for the setting up of LIFE UK but have taken it no further. Is there any interest in me making this visible? The reporting of the burning of blanket bog by the public is a superb example of how we can move from liking the manifesto to actual implementation. In the case of blanket bog, the suggestions here of what a walker needs to take with him to record possible infractions together with a website where they could be recorded with the needed information, a central mapping system as already exists for other records, and we would have a formidable body of evidence gathered which would be difficult to challenge. The hedgehog hole would require someone to propose actual changes in legislation, and lead politician/s and a "celebrity" sponsor or NGO. A blog could record progress and communication by people to their MPs in England or devolved politicians elsewhere. I would not underestimate how difficult it may be but the rewards may be rapid implementation in some cases. In Scotland, reporting burning on peatland (maps of peatland are available online) to the local RPID office should be the first action. Give them solid evidence of burning contrary to the Muirburn Code and they can penalise payments for the breach. Yesterday afternoon saw us driving towards Kirby Lonsdale. Far to our left, maybe north east Howgills, was a burn in progress. Bearing in mind that Mark highlighted the start of the season only last week and a commenter made the point that we wouldn’t see burns until the new year, I joked to my wife that we should take a photo. Given the comments made here, I wish I had. 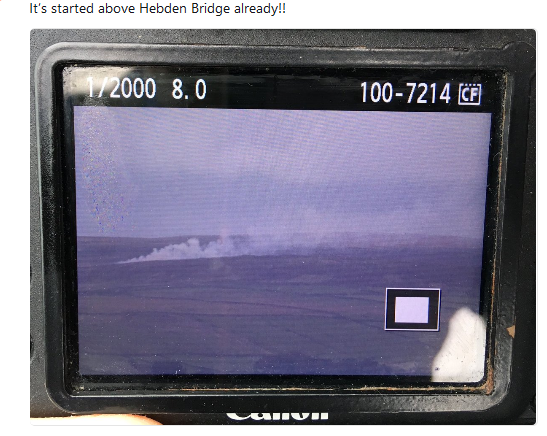 I've seen smoke from Blubberhouses Moor, Nidderdale in North Yorkshire over the past couple of days. Who does this moorland belong to? No smoke today though, just rain.